Imagine spending a night under the open sky with your RV while enjoying BBQ, suddenly the light goes down and halts music beats. On inquiring you find out the short circuit have shut down your appliances. In these scenarios, RV surge protectors come to the rescue. Only the best RV surge protectors will keep all the appliances safe from the short circuits and of course you don’t have to break your bank balance on the repairs either. An opportunity to save money, you say! Now, there are so many surge protectors floating in the market. Choosing the right option for your RV can be a bit irksome task. But on the positive side, you do have plenty of options in terms of price and quality. Just find out what you want to achieve with your surge protector and consider the options accordingly. For example, if a 30-Amp surge protector is sufficient to cater your needs then you don’t have to buy a 50-Amp unit. It’s that simple …finalize your decision according to your requirements and you will keep yourself at bay from overspending. Now, let’s start our discussion on what’s a surge protector and how does it operate! What is an RV Surge Protector & how does it work? An RV surge protector keeps your appliances safe from those voltage fluctuations. For instance, some surge protectors protect the electrical equipment in your RV from high or low voltages others detect any reverse polarity, open neutral or open ground. All in all, surge protectors are all about keeping the power supply properly regulated. So how does it achieve all this? Well, this piece of equipment achieves it by shorting or blocking the supply of voltage to an appliance from the source with above-threshold power output. In simple words, your appliances will receive regular power even in the low or high voltage situations. How can you actually use this … just plug the surge protector into the power pedestal that you will find in the RV site or campground and you’re good to go. That’s not all. . .
Detect for adequate voltage, grounding, frequency, and various other elements. Assess the current condition of your power source. It will then provide you with any potential problems before they start causing issues. Come with features like auto-restoration and they will also cut the power if required and restore it back for you. To sum up, the best RV surge protectors keep your machines and all of its components safe from numerous power boo-boos. Do you need a surge protector for RV? Knowing how faulty those park powers can be, of course, you need a surge protector for your recreational vehicle. It can do so many things for you. You will definitely have the peace of mind that your RV is safe from any open ground, reverse polarity or open neutral because a surge protector detects it in real time and beforehand. The appliances you have in your RV stays safe from all voltage fluctuations. The benefit of all this is that you are able to identify and resolve a problem even before it occurs. Some of the RV surge protectors even take convenience to a whole new level! For example, they will automatically disconnect the power in case if there is low or high voltage and then restore the power back on when the voltages are back to normal. If you want to have fun while RVing then this piece of equipment is a must-have, that’s for sure! To understand what are the best power surge protectors, we need to know its different types. As RV surge guards have different types, finding the right one that meets your needs is essential. In terms of capacity, you will either find 30-Amp surge protectors or 50-Amp ones. Choosing between these two types is just a piece of cake … pick the capacity based on the number of appliances you have in your RV. But that’s not all … in terms of versatility, there are further two types of surge guards! It is the most common type of surge guards that RVers use. What’s the real story! Well, you can easily use it from one RV to another. These surge guards are plug-and-play and there is no fuzz about the whole installation process with these units. You will only need to directly hook it up to the power pedestal and then plug it into the camper. There is no need for wiring it into your motorhome. Additionally, the replacement of these surge guards involves no hassle. As the name goes, you will have to wire these surges into your camper. It will come with all the hassles that portable surge protectors don’t have but here’s a catch! Hard-wired surge protectors are made of durable components and you will not need to hook anything up either. Most of the hard-wired units are installed close to the power wheel. A number of camper owners prefer to use hard-wired units. But why? These units are concealed from sight so there is a very minimal chance that your unit will get stolen. Another benefit is that as it is internal you won’t drag it on the ground and this is very critical in wet or rainy conditions. Now let’s take a look at the comparison and then move to RV surge protector reviews! On the other hand, we and some of our friends own RVs too. For this reason, we have been able to test different surge gauds real time. So we have developed this list by integrating those customer reviews as well as our own personal experience. Progressive Industries is the leading company that provides reliable, compact, and sleek designed surge protector for your RV. The SSP-50XL surge protector is UL certified and approved by Canadian, which makes it a smart portable surge protector. Here is the deal … the weather resistant and thermally protected features make it easier to use in your RVs. The SSP-50XL surge protector has an electrical rating of 120-240 Volts, offers surge suppression for 1650 joules, and 12000 Watts as well. Moreover, it comes with three colors brighter LED that indicates the current condition of the protector. You can check the status of a power source for protecting your RVs electrical appliances. If you face any issue about the miswired pedestal, the indicator light will go off. Progressive industries RV surge protector is weather resistant and thermally protected, which allows you to use it in all weather and in all situations. On the other hand, the manufacturer designed it to use for outdoor purposes that perfectly operate in -40°C to +105°C temperature. The best part … No complex installation and assembly is required. The SSP-50XL surge protector equipped with polarity tester that checks the power sources timely for protecting your electrical devices in RVs. This style of surge protector also offers open neutral, open ground, and reverses polarity detection features. These features immediately alert you if something goes wrong within a second after plugging it in. Additionally, you can pull a rugged handle for plugging into the shore power easily at any time. The 50-Amp Progressive Industries surge protector has an indicator light for displays the multiple issues. It offers a lifetime warranty. Suitable to detect open neutral, open ground, and reverse polarity. The quality of the light indicator is not durable. The 50-Amp surge protector offers plenty of features such as polarity detection, weather resistant, thermally protected, which presents compact and perfect portable surge guard for your RVs. Furthermore, if you are looking for a more powerful surge protector for protecting the RVs electrical appliance, here is the deal … you can opt Progressive Industries EMS-PT50X portable RV surge protector 50 amp. Click here to reveal the actual price. The Technology Research presents the reliable surge 44270 protector, which offers complete protection against any power surges and power failures. In addition to that, this surge protector utilizes 50-Amps and provides 4200 Joules of surge protection for your RV electrical appliances. It has plenty of indicator lights that show the current condition of plugged appliances. These lights include open ground, open neutral, miswired, power on, no power, and neutral reversed. When there is an issue of miswired, the red light indicates the related issue. This weather-resistant surge protector provides protection to electrical devices of your RVs in all weathers. How can this actually works? … You can save your RVs equipment from any damage because it reduces the potential damage from overheating. The efficient surge proctor utilizes the 50-Amp. This portable unit process and gives a quick response by displaying the lights. You can confidently plug the electrical appliance and enjoy your trip with peace of mind. This 50-Amps surge protectoris reliable, efficient, compact, and portable. The weather resistant feature permits you to use it in all-weather condition. It provides surge protection rating as 4200 joules and makes it best entry-level surge protector for your RVs. It analyzes the circuit and alerts you about the status of the power supply. Suitable to use for outdoor purposes as well as easy to configure and use. The blue light may stop working after sometime indicating open ground. If you are searching for an entry-level surge protector for your RVs then this is a suitable option. Last but not least… It can handle all harsh weather conditions such as snow, wind, rain, sun, and more. Click here to buy. The Progressive industries designed the best RV surge protector 30-Amp with a high-quality compact unit. You can use it only for outdoor purposes and it utilizes 30-Amp with 825 joules of surge protection rating. A progressive surge protector is a reliable and durable protector because the manufacturer has used heavy-duty material. Why does this matter? … This heavy-duty material presents the weatherproof surge protector that can works finely in all harsh weather. It also protects the equipment from overheating because it comes with thermal protection feature. The brighter LED indicator informs us immediately about the multiple issues. These notifications and alerts make it more attractive and reliable guard for RVs. In addition to that, it has sturdy pull handle as well as a locking bracket to make it secure in place. This portable surge guard protectors 30-Amp provides multiple features that include instant detection of open ground, open neutral, reverse polarity and much more. On the other hand, it is easy to assemble, use and ideal for your RVs. The secure, compact, and unique design makes it suitable to protect the electrical devices in your RVs. It comes with an LED indicator that displays the notification and alters to tell you about the current condition of the appliances. You can use it in rain, snow, wind, or sun with confidence by ensuring the safety of the RVs electrical appliances. This is an analyzer unit and a protector means you can leave it plugged in the entire time. This thermal protection surge guard is ideal for the RVs, which can protect the equipment from overheating. It is bigger in its dimension. The indicator light flicks after some time. This 30-Amp RV surge protector is easy to install and use. Using this device would protect your RV from damage caused by the bad wired power supply at a campsite. Click here to find out more about the product. Camco presents the best choice for those who are looking for a durable and high-quality surge protector for their RVs. It uses the heavy-duty components and materials, which deliver the best outdoor surge guard. This is the safest surge protector that utilizes 50-Amps. Camco surge protector is equipped with the diagnostic lights that alert you immediately about the issue. It visually indicates the faults before connectivity with the RVs Power Cord to the electrical box. This visual fault helps to fix the problem quickly and without any hassles. The manufacturer presents the solid value and reliable designed surge protector that comes with some cutting-edge innovations. It offers great surge suppression rating of 4200 Joules and ensuring your valuable appliances are protected from any damage or faulty connection in the RVs. Another great feature of the Camco surge protector is that it offers many protection modes. But there is a catch … it also informs you about the faulty connections. For instance about open neutral, reverse polarity, open ground and much more. A powerful grip handle is placed on it that makes the plugging or unplugging easier and safer. The Camco surge guards are weather resistant that allows you to use it in all harsh weather conditions both in scorching heat and heavy snow. It works perfectly for 50-Amp outlets, provides surge protection more than 42000 joules, and uses 125-Volts. The diagnostic lights indicate the faulty connections and keep your RVs safe from electrical surges and improper wiring. The cutting-edge innovative design makes it easy to install and use. It is not suitable to use it in heavy rain. This product is not UL certified. You’d find Camco surge protector useful because it comes with innovative design along with diagnostic lights. 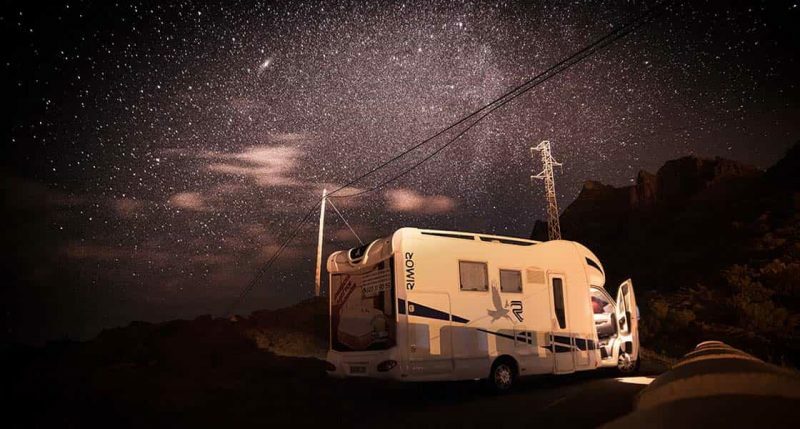 The lights inform you about any faulty connection and protect your RVs safe from any damage. Find out more about this product here. The Technology Research designed the most powerful surge protector 34850 that comes with full surge protection ability. Here is the deal … it can help to monitor the voltage, reverse polarity, and amp consistently and instantly. The automatic reset feature allows the surge protector to work accurately during power restoration and plug disconnection. The great feature is … It automatically powers off the surge protector in the event of overheating and open ground. It also comes with an LED display that provides a basic notification and alerts to know about the issue. Technology Research surge protector is an intelligent protector and versatile. This is ideal for equipment that uses 50-Amp in their RVs, Motorhomes, and travel trailers. Additionally, it offers more than 3850 joules of surge protection and has an LED display to indicate the current situation of appliances. The lightweight and the portable unit make it easy to install and use. It comes with a convenient and user-friendly handle that make the plugging and unplugging easy and safe. Moreover, this reliable surge protector is ideal for your RV because it provides complete protection from any damage. The manufacturer designed the reliable, versatile, lightweight, and portable surge protector that protects the electrical appliances of your RVs from any damage. It has a user-friendly convenient handle that enhances security while plugging or unplugging. It gives more than 3800 Joules surge suppression and ideal to use of 50-Amp services for your RVs. It offers an automatic reset feature that automatically shuts off the protector during open ground and overheating. It does not have surge failure indicator. This is not a budget-friendly product. The built-in intelligence and automatic reset features make this surge device powerful and reliable protector for your RVs. It automatically shuts off the unit in case of overheating that protects the electrical equipment from any damage. Find out more here. The Progressive Industries designed the great Electrical Management System (EMS) HW50C surge protection device. It provides complete electrical protection for your RVs electrical appliances that utilizes 50-Amp electrical services. The Progressive Industries surge protector comes with the digital display. It displays vital information about all the plugged devices whether they are working properly or not. Here is the best part … it alerts you any potential issue within a second after plugging devices in it. Furthermore, this information lets the user easily access frequency, voltage, previous error code, present error code, and much more. The multiple modes of this surge protector add to the protection. It protects the RVs in an efficient way that includes lost neutral, open neutral, voltage protection, and reverses polarity. The manufacturer uses superior quality material and components to presents the heavy-duty surge protector. Here is the deal … you can use this great surge protector in all tough and weather conditions. It presents great efficiency and performance at the same time and provides protection from surges due to failures and faulty of power shores. The surge protector comes with multiple modes to protect your RV from damaging your electrical appliances. It has a digital display that displays important information about power failure and much more within a second. The manufacturer uses the heavy-duty material to presents the durable surge protector that works perfectly in all outdoor tough conditions. It is Canadian approved and UL certified that uses 50-Amp and surge suppression for 3580 Joules. It indicates the surge failure and miswired pedestal as well. You’ll need an expert for its installation. Progressive Industries manufactured the Electrical Management System, which provides complete protection to your RVs electrical appliances against all unpleasant power and weather conditions. Click here to find the discounted price. As we know, multiple RV parks and camping grounds do not have reliable and consistent power sources. Therefore, the Surge Guard designed the best surge protector that is the ideal choice for travel trailers, campers, and mobile homes. The power suppression rating is 3850 Joules and it utilizes the 50-Amp. The automatic reset feature is one of the great features of this product that resets its functionality in multiple events. There is no need to restart it manually because it automatically shuts off the protector when the situation arises such as overheating. This makes the product more convenient to operate. Surge Guard manufactured it with multiple modes of surge protection. It ensures efficient working by providing complete protection to your RVs. That’s not all … it keeps the recreational vehicles from open neutral, open ground, reverses polarity, and many other protection features. The company designed to keep the A/C compressor for its reset delay about 128-seconds. Most people consider this a critical feature to look for in the surge protector. No complex techniques are required to install it in your RVs. The heavy-duty materials and components are used to construct reliable and ideal surge protector. You can easily use it in all weather conditions such as wind, snow, sun and more. You can protect your RVs from multiple power failures issues and the surge suppression rating of power is 3850 Joules. The hardwired model of a surge protector is best to use in large RVs, trailer, home motor because it is easy to install. Budget-friendly option with complete protection. The dimension of this surge guard is a bit larger. The Surge Guard presents the superior protector that save your money for the reason that it gives plentiful protection to all your electrical equipment or devices on the RVs. these include hairdryer, oven, laptop, toaster, laptop, TV, and much more. Find out more about the features here. EMS-PT30X is a circuit saver for your RV when plugged into the electrical source. It comes at a very decent price and has plenty of features to offer. One of the primary reasons for this product’s popularity is its robust design. Progressive Industries has used high-quality materials in the construction of this surge protector and for this reason, it provides you with an excellent all-weather performance. And the best part is the… there is a plastic lid on it as well that keeps the internals of the unit dry even in heavy downpours. The pulling handle of this unit is rugged. This means that you cannot pull it down easily. It offers you a lot of safety because the handle will only move in case there is a fluctuation in the voltage. Why does this matter? well, you don’t want the pull handle to move freely as a free moving handle can be dangerous. As this surge protector from Progressive Industries is a portable unit therefore, it’s very easy for you to install. You just have to hook it with the park pedestal and then plug it into your RV and you’re all done. Protects your appliances from bad power failure. Displays the amps your devices are consuming. It comes with all-weather protection. The surge protector also features a secure locking mechanism. There is a lifetime warranty on this surge protector from Progressive Industries. The pull handle of this surge protector is very tough. The EMS-PT30X is not a UL certified product. The Lifetime Warranty voids in case of damage. If you’re looking for a perfect balance between features and price then this surge protection unit suits you. The EMS-PT30X 30-Amp EMS with surge protection is a good choice for mid-sized RV owners. The product is not UL certified but it does come with a very solid weatherproof design with a lifetime warranty. Check out the price tag here. If you own a small sized camper then this surge guard from TRC will be the best option for you. The installation of this unit is very simple. You just have to hook it up to the power pedestal in the campsite and then plug it into your vehicle. The 44260 Surge Guard will provide you with the best bang of your buck. The surge protector offers 2100J protection and it will easily handle those voltage spikes that the faulty park power very commonly features. The surge guard from TRC will keep all your appliances safe and will provide you with the peace of mind that you need on your trip. The 44260 surge guard is strongly built and Technology Research has made sure that it can last for a long time. Now you don’t have to worry about the storms that head your way when you are RVing. The 44260 surge guard has got you covered with its robust design. Among the best features of this surge protector is its LED indications. You will be able to read the device’s current status with ease. It will indicate you when it detects reverse polarity, open ground and opens neutral. Also the unit comes with a limited lifetime warranty too. Identify those faulty park power supplies and keep the surge under control. There are different indicator lights to show you the current status of this device. The installation process for this unit is very easy. It can easily detect open neutral, open ground and reverse polarity. It is not the best option either for Class A recreational vehicles or Class Cs. The surge guard can take care of surge protection but will cut off power when the voltage gets low. This surge protector is not UL certified. This surge protector will check campsite power, secure your devices and pays itself for many times. We would say it offers great value for money. Check out the availability here. The RV220-50 Autoformer by Hughes does come with a hefty price tag but there’s a huge return … It has the ability to fit multiple models and protect your RV from both low and high voltage surges. One of the best features of this surge protector from Hughes is its automated boost. Here’s the catch … in case of low voltages this surge guard has the capability to automatically boost the voltage capacity by 10%. This is enough to run all the appliances in your recreational vehicle fully power optimized. The RV220-50 surge guard also has a very crystal clear LED indicator lights. These lights will provide you with all the guidance on the current voltage status of the park power. Additionally, when the above said 10% boost is on, a separate indicator light will turn on as well. This surge guard is equipped with 4800J advanced technology for surge protection. The best part is … you will not only get the surge protection feature but will also benefit from the voltage booster properties of this unit. 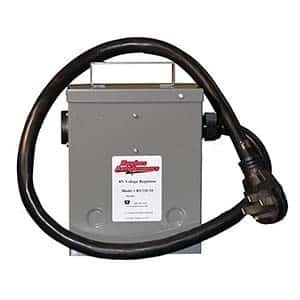 In simple words, this unit will keep your RV safe from voltage hikes and will provide the additional boost when the supply is on the lower side. The 50-Amp surge protector is the best option for Class A recreational vehicles and also for large-sized Class Cs too. It features automated voltage boost feature along with surge protection capabilities. The LED indicator lights immediately indicate the current status of your surge unit. Comes with 2-year warranty and is a UL listed surge protector. The surge protector only weighs 35 lbs so you can move it around with ease. It is not the best option for smaller campers and recreational vehicles. The feature that differentiates this surge protector from our previous entries is its ability to provide voltage boost … in addition to surge protection. Check out the latest price here. There are many factors you need to consider before finalizing your purchase decision. Why does this matter … because there are so many brands available on the market. Picking the right option can become a bit of an eschewing job and you don’t want to waste your money on a product that doesn’t fulfill your needs. Outdated RV site pedestals are bit of a problem because surge protectors only offer limited protection with these pedestals. If you are facing the same scenario then opt for an electrical management system or EMS. EMS is far more expensive than a surge protector but here’s the benefit! It offers a lot more protection as compared to surge guards. But an EMS is a better option for avid RVers. If you go to a properly equipped and updated campsite then a surge protector will also do the job for you. Joules rating is critical and you must consider before buying a surge protector for your camper. This rating is the level of protection or voltage surge suppression that the unit can provide to your recreational vehicle. It will also measure the ability of the unit to disperse heat caused by the surge spikes. In simple words, if this rating is higher, the unit will offer better protection and will last longer. Another rating that’s crucial is the amperage rating. A unit will only be able to perform its function if it doesn’t get an adequate amount of electricity. If it doesn’t get the amount of electricity according to its amperage rating then it won’t function properly and your rig will not be safeguarded from voltage fluctuations or surges. Always look for a UL listed piece of equipment when you are buying a product that has something to do with electricity. Here is why … UL certification guarantees that consumers are buying a quality assured and safe product. It means that this product will be safe for them to use for their camper. Furthermore, this certification guarantees that the product offers a good bit of longevity too. There are some surge protectors that come with additional features. You can prioritize each of them based on the campsites you visit and the weather conditions. For example, some surge protectors come with waterproof capabilities. Some of them also come with features to automatically cut the power in case of power surges and turn the supply back on when things get back to normal. Also there are different types of surge guards that can monitor open neutral, open ground or reverse polarity too. All these features come at some price. It depends upon how much you are willing to pay to keep your rig safe. Most RVers look for easy installation features when buying a surge protector for their camper. If you are looking for a unit that is very easy to install then go for a portable one. You will only have to hook it up. On the other hand, its hardwired counterpart needs to be wired into the camper and needs a far more intense installation job. But there’s a catch … hardwired units offer better durability and there will be no dragging on the floor with this unit either. Weight is a considerable feature if you tend to move around your surge device a lot. Your unit needs to be lightweight and compact. However, don’t compromise by opting for low-quality materials. Your surge guard needs to come with resilience against wet weather conditions and for this reason, it must feature a tough external body. You can look for good quality materials but also consider the lightweight and compact design of your unit. This way you can easily transport it from one place to another. A surge protector with an LED display adds to its user-friendliness. The best part …you’ll easily read the metrics of the different things that you need to know. For example, you can read the current voltage, frequency and similar other information with LED display. Look for a display that is bright enough for you to read in the day as well as night time. Also, make sure that the information displayed is easy for you to interpret or understand. If you tend to visit campsites that are located in humid climates or areas that receive a lot of rainfall then your surge protector needs to come with weather protection too. Most of the surge guards these days come with a plastic lid to keep water away from the inside. Take this into account if you are planning for RVing in the rainy regions. Weather changes drastically too. Maybe you have planned for a sunny outdoor afternoon but all of a sudden you are seeing that thick cloud cover with heavy rain just around the corner. In this scenario, a surge guard with weather protection will get the job done for you. Don’t underestimate the role of surge protector in your RV just because of its hefty price tag. It may cost you more than a hundred bucks or more but definably can save you thousands. Just like any other appliance, there are many brands on the market when it comes to surge protectors. They also differ in terms of features and price. As different users have different requirements some will prefer features over price while others will go in the opposing direction. Here is the deal … make sure that you don’t overspend on those features that are not needed. There are different brands that you will find when it comes to surge protectors. However, not all of them have quality products to offer. The two major players in this market are Progressive Industries and Technology Research. They both make surge guards and EMS units for motorhomes, campers and travel trailers. Furthermore, both these brands provide lifetime warranties on their surge protectors. However, if you are really looking for performance then Progressive Industries should be your choice. Here’s why … their units feature integrated locking system and weatherproof assembly. Progressive Industries (PI) also provide field services for their hardwired units. Technology Research (TR) on the other hand, is also a good brand but doesn’t offer as much product support as PI does. However, their products do offer durability. Some other worth mentioning manufacturers are Camco, Hughes and Search Guard. Their products are also good for their price but PI and TR the market leaders when it comes to surge protectors. These two brands are a bit on the costly side too but, if you are looking for best RV surge protectors then these are the two brands you should opt for. Do you need a surge protector for RV! Is RV surge protector necessary? Of course, you need it. You RV has expensive electrical devices installed in it and you have to protect them from a surge. In most cases the campsite power line is faulty and there are too much low or high voltage fluctuations in such a power source. Using a surge protector will keep all the equipment safe. And the best part … these units can also check for any open ground, open neutral or any reverse polarity too. Will a 50-Amp surge protector work on 30-Amp? For a quick short answer, no it won’t! If you have a look at the power cord, you will easily come to know that a 30-Amp surge protector will have three prongs. Its 50-Amp counterpart has four prongs. Your motorhome or camper is also amperage rated. Most of the Class A RVs or large Class C RVs are 50-Amp. Any smaller vehicles then this are 30-Amp. For a simple rule of thumb, if your camper features a couple of air conditioners then it will be a 50-Amp vehicle. So, in simple words, you can only buy a corresponding surge protector that configures with your RV amperage. What is an EMS surge protector? EMS or Electrical Management Systems are the advanced versions of surge protectors. As we have mentioned above that there are some types of surge protectors that can also detect open neutral, reverse polarity and open ground. Those types of surge guards are actually EMS systems. An EMS can automatically cut the power off and turns it back on when the voltage fluctuations reduce. These units are expansive as compared to the regular surge protectors but here’s a catch … these units are more durable and offer more top-notch performance as well. Can you use a surge protector with a generator? If your recreational vehicle has an inverter generator then it is better for you to use an EMS instead of a regular surge protector. Generators that are present on motorhomes or recreational vehicles have floating neutrals. A regular surge protector will not detect it because it’s an open neutral but an EMS will. This is where it will prove to be useful! The EMS will not let the power flow through your RV and there will be no danger associated with low or high voltages. Which one is better, surge protector or EMS? Most of the RV owners ask this question that which one of these two is a better option. Well, there is no definite response to this question. It’s all about your personal preferences and likings depending on your situations. Surge protectors detect voltage spikes and keep your RV safe. The best part is …the surge protectors are very cost effective. On the other hand, EMS is expensive but here’s the deal … EMS not only detects voltage spikes but also checks open neutrals, reverse polarity, and open grounds. Now it all depends on your preferences and needs that which one of the two will you choose. How to use an RV surge protector? Top nortch RV surge protectors are very user-friendly. One thing you need to keep in mind is that users might vary from brand to brand. Here is what you can do … consult the instructions mentioned in the manual that comes with your purchase. In most cases, you just have to hook your portable surge protector into the power pedestal at your campsite. After that, just plug it into your RV. The best part is … you don’t have to wire it into your vehicle. If you have a hardwired surge guard only then you will have to wire it into your vehicle which involves a bit more complication as compared to the portable surge guard. Is the RV surge protector waterproof? Although it is a must-have feature for a surge protector, not all brands offer it. For this reason, you need to do thorough research before you start considering your options. Most of the latest models of surge protectors do come with waterproof features. Therefore, these options are much more suitable for you to use in wet weather conditions too. Otherwise most of the brands also use weatherproof materials in the construction of their surge protectors too. Hence, you will find a lot of RV surge protectors that feature waterproof capabilities. To sum it all up, the winner of this roundup of best RV surge protectors turns out to be the SSP-50XL from Progressive Industries. This 50-Amp surge guard features a weather-shield cover and comes with 1650 joule and 45,000A rating. It can easily detect open neutral, open ground, reverse polarity, pedestal miswiring or surge failure too. The best part is … this surge guard is made for outdoor use and is resilient in varying weather conditions. Also, It has a very rugged handle and there is a locking bracket too. The UL listed surge protector comes with a lifetime warranty as well. If you move around in your RV a lot then a surge protector will prove to be a blessing in disguise for you. There are so many benefits that this tiny device has to offer. It is important that you invest in a good quality surge guard before you go on to your next trip to have a peace of mind. We hope you have found this post very informative. If you have any questions or suggestions for us, then leave a comment below.